First lets start by saying great breeders will have already done this for you. 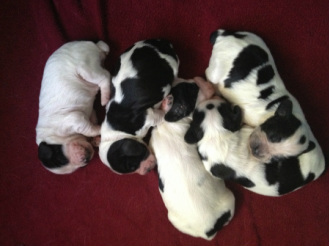 Breeders that have spent time with the litter over the last 9-10 weeks will know the temperament of each puppy. They will have interviewed each potential new owner and know exactly what each is looking for in their new addition. From time to time great breeders may give the final choice to the new owner between two puppies that have very similar personalities. But just in case you find yourself in a situation where you may need to choose which puppy will best suit you, here are some guidelines. When choosing your first show dog you should really deal with a great breeder that will help guide you. When seeking a show dog you will need a pup that is very outgoing. He should be one of the first ones to come to you, he should hold his head high and proud. You are not necessarily looking for the bully of the litter. He should be medium sized not big. His head should be spaniel looking not like a Lab with a blocky head or like a Setter. His expression should be soft and intelligent looking. His bone should be medium sized not big and thick. His feet should be straight not turning in nor out. The ears should be lobed in shape not triangular. Remember that moderate is what your are seeking - Big, Blocky, Heavy is not in keeping with the standard. You will want to look for a pup that is medium to smaller build. Do not seek the largest pup from the litter. The largest pups may very easily become to overdone and tire in the field. You should look for an energetic very alert pup. Bring a small puppy training dummy to toss to several of the pups to see which one fetches it first. Shake your keys, peep a whistle see which pup responds. You want a puppy that will be easy to train and those who respond first most likely will want to please their new owner. 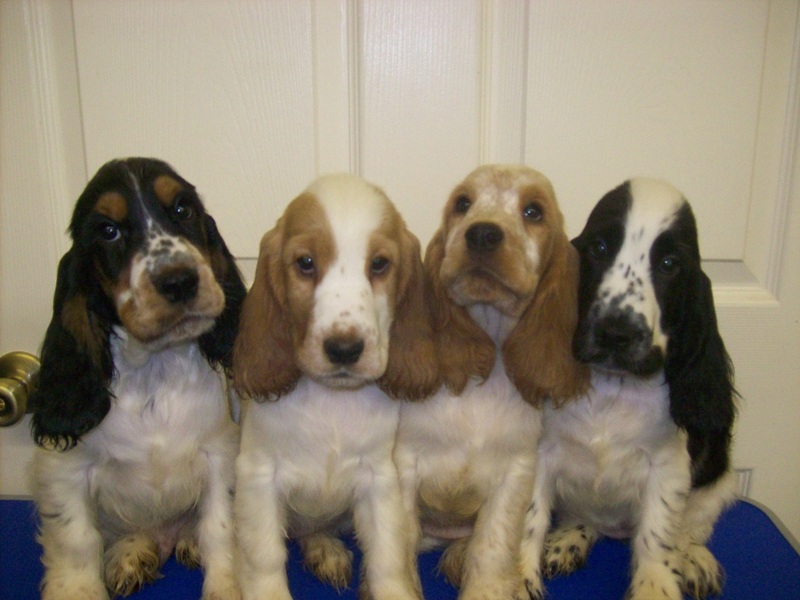 Never choose the shy or timid puppy form the litter for your hunting companion. Remember that moderate is what you are seeking- Big, Blocky, Heavy will not be able to the job as well. You should first ask your family what your intentions are with your new puppy. Is he/she going to do activities with the family such as camping or hiking, go the kids soccer games to watch from the sidelines, or are you seeking a pet that may end up doing some obedience trials or agility trials? When you and your family answer that question then you are ready. Typically puppies that are shy or timid are best suited in a quite home, they would be happy to take a daily walk and attend the soccer game on Saturday. Usually quite and timid children are a perfect match with these puppies. A more outgoing pup such as the largest rambunctious one of the litter would be a perfect fit for the active family with active children. These pups can play all day and keep pace with the active family. Most of your very outgoing pups make great performance dogs for obedience and agility trials as well.